Do you know someone that lives for vacations, and is always ready to get that party started! 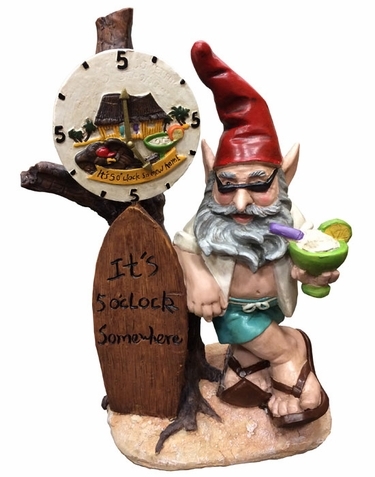 If so, they're going to love our new "It's 5 o' Clock Somewhere" Vacation Gnome! Quite possibly the most detailed, and amusing gnome we've ever released, this vacationing beach gnome was born for sunny weather and lime margaritas! Our new Beach Gnomes collection is already a huge hit, and this new "It's five o'clock Somewhere" addition is the true rock star of the bunch. Leaning into his drink and surfboard he'll check his amazing clock to see if it's time to party! Amazing design with sunglasses and beach attire, drink with lime, flip flops, surfboard, and a grand piece of beach wood that holds a clock with incredible detail, you are going to love this new Beach Vacation Gnome! Put him by the beach house, by the poolside, at the BBQ gathering, or right on top of your indoor or outdoor bar. This impressive whimsical gnome will be loved by all!